Thailand politics is something not many know a lot about, but in recent years there has been a lot of political news stemming from Thailand. Thailand is a lot like the United Kingdom in its current state of politics, but with a lot more stability issues that the United Kingdom doesn’t see. The reasons behind this are intriguing, but to understand them you first need know more of Thailand’s government as a whole. The country of Thailand is currently known as a constitutional monarchy, a type of government that only a few countries still hold onto today. This type of government is unique because unlike a pure monarchy, the monarchs are typically strictly just political figures with very little power, or power that is limited by a constitution. The main decision-making comes from elected officials that are within a parliament, much like the United States Congress. 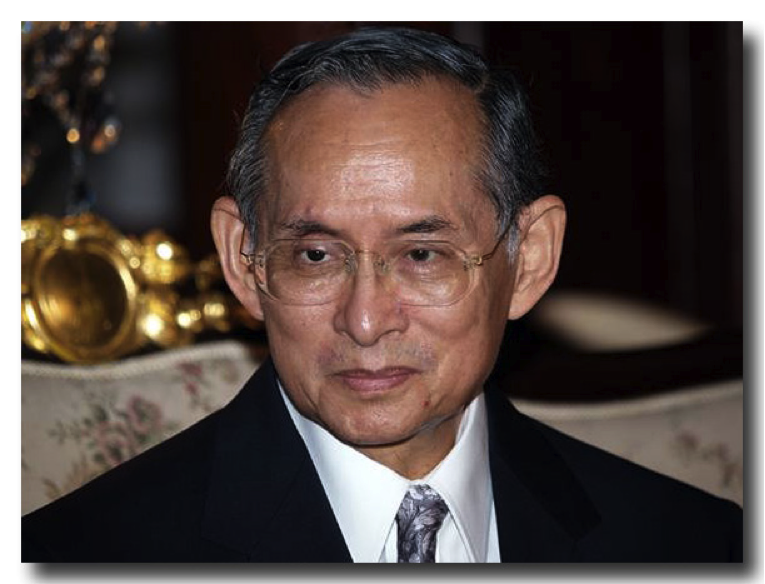 The current King of Thailand is King Bhumibol Adulyadej. King Adulyadej is currently the world’s longest reigning monarch, with a reign of 66 years, 6 years longer than Queen Elizabeth II. 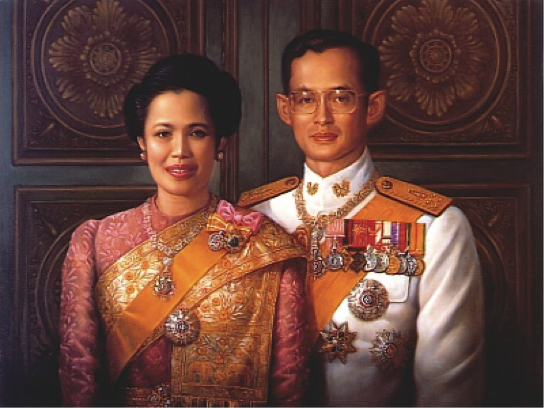 King Adulyadej became king of Thailand in 1946, and married in 1946 to the now Queen, Queen Sirikit. To commemorate King Adulyadej’s 50th year of King of Thailand he was awarded the Golden Jubilee, and for his 60th the United Nations awarded him the Human Development Lifetime Achievement Award, for his achievements in aiding many of Thailand’s poor citizens. For this, among many other reasons, Thailand’s citizens have a lot of love for their monarchs; this has been implanted in them so deeply that it is actually punishable by law to denounce the monarchy in Thailand. King Adulyadej is also, surprisingly enough, the richest monarch in the world with an estimated net worth of $35 billion dollars. A “new” government was formed immediately after the coup. General elections were promised within a year, and Thaksin was allowed to return to the country. Thaksin currently remains in a self-imposed exile however for fear that he will be arrested along with his family if he does return. In recent years many of his supporters have been seen to be wearing red shirts in support of his return to power as well as to Thailand. 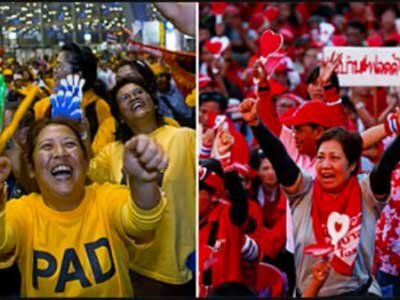 In contrast the yellow shirts are supporters of the monarchy. Following the election promise Marshall Law was declared, and censorship of media outlets became an important part of keeping people “in-check”—–no defamation against the military was allowed on any airwaves, or social media. The self-declared “temporary” military regime banned any form of political assembly or protest by Thai citizens, and any group of people that exceeded five in number were required to hold a permit to travel throughout the country. Elections did indeed happen one year after the coup. However, not before the military regime established the Permanent Constitution for the Kingdom of Thailand in August of 2007. The Constitutional Tribunal, which drafted the new Constitution, outlawed the Thai Rak Thai party, the largest political party in Thailand, from participating in politics for five years. Attempting to bypass this ban, the TRT dissolved and regrouped under the name, People’s Power Party. While the military regime attempted to subdue the PPP, the party won the popular vote of the people in December of 2007, gaining a majority in the House. This “win” was not taken lightly by the military regime: various members of the PPP were given “red cards” and accused of corruption. Rumors of dissolving the PPP spread, and by 2008, the PPP had merged with five smaller political parties, leaving the Democratic Party as the sole opposition in elections. Abhist Vejjajiva was elected Prime Minister of Thailand in 2008. Abhist based his political platform on rights for the people, especially the rural and working poor of Thailand. However, his actions did not align with his platform. He was accused of immense amounts of corruption and censorship of the media. As political protests increased due to his regime, so did accusations of human rights violations and torture. People around the country became more skeptical of Abhists’ actions and his motives. His “crackdown” of the protests by the National United Front of Democracy Against Dictatorship in 2009 resulted in several deaths and hundreds of injuries. This of course heightened the scrutiny that Abhist was already facing. In July of 2011, Thailand once again held a general election. This time, Abhist Vejjajiva would run against Yingluck Shinawatra, former Prime Minister Thaksin Shinawatra’s sister. 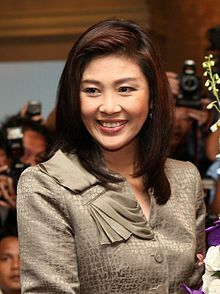 Yingluck was running in affiliation with the Pheu Thai Party(PTP), while Abhist ran with the Democratic Party. The Pheu Thai Party won the election by a landslide. Naturally, accusations of corruption were present, and a reelection and recount was ordered in several Thai provinces. Still, Pheu Thai kept its win, and Yingluck Shinawatra was named Prime Minister of Thailand. Currently the political climate in Thailand has calmed in comparison to recent years, this however isn’t a guarantee that things won’t change in a blink of an eye. The Thai people have shown that they won’t put up with the corruption of government officials, as has the Thai military. This is possibly one of the reasons the Thai government is undergone so many changes in the past few years, as well as attributing to the stability issues the government has faced in recent years. One thing is for certain however; the Thai people take politics very serious and will put their vote and voice where it counts when needed. The Nation. (2006) What Thaksin had done wrong. BBC News. (2006) Thai King remains center stage. Asia Pacific. Roberts, J. Symonds, P. (2006). Thailands Coup Leaders Suppress Democratic Rights. WSWS.